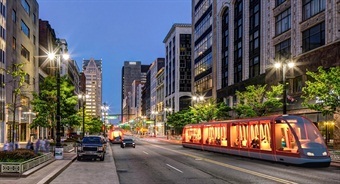 DETROIT — When the 3.3-mile modern streetcar, M-1 Rail debuts in 2017, it may be officially known as M-1 “RocketRail” – one of the names Quicken Loans Inc. has federally trademarked. For $5 million, Detroit-based Quicken bought the right to name the line for 10 years, The Detroit News reported. Selling the naming rights for an entire mass transit system puts Detroit future streetcar on the forefront of a trend in public transportation, say several industry analysts, according to the report. “Detroit is on the cutting edge of this and we should expect to see more,” said Robert Puentes, who studies public transportation and infrastructure issues at the Brookings Institution, a Washington think tank, The Detroit News reported.